My 9 year old son is obsessed with reptiles. Our family includes a gecko and now a ball python. 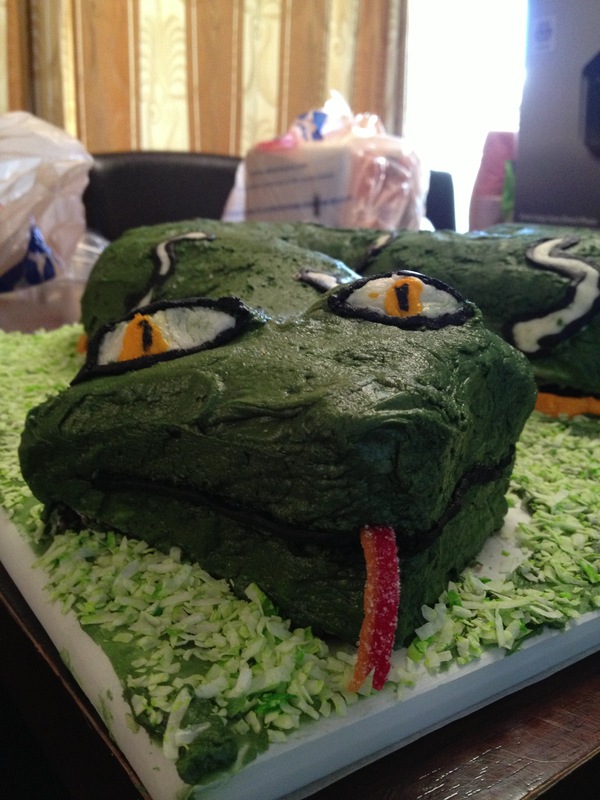 His reptile themed birthday party requied a reptile cake. Pinterest to the rescue! 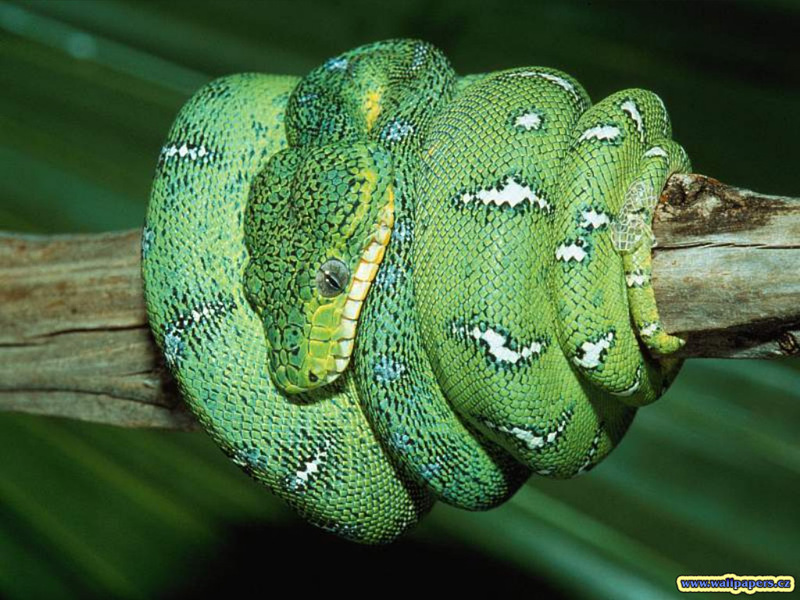 Search for reptile cakes and snake cakes and be amazed by the crazy-talented cake decorators and cake sculptors out there! Thank you for providing insight and ideas! Two Bundt Cakes – “The Martha Stewart Cookbook” recipes for Devil’s Food (chocolate) and Whipped Cream (white) cakes to accomodate all attending the party (translation: for the fools that don’t like chocolate cake!). One 9″ Devil’s Food Cake – same recipe as above. One recipe made enough for the bundt and round cakes. Four pounds of C & H powdered sugar – Buttercream frosting recipe on the back is quadrupled to frost this cake. Red sour punch candy for tongue. After wrapping my extra large cutting board in parchment, I cut the head shape from the 9″ round, using approximatly half of the cake. Half moon shapes were cut for the raised eyes. My kids were gracious enough to eat the other half of the cake unfrosted as an after breakfast snack. Both bundt cakes were cut and half and arranged on the board. One half of each bundt was quartered and rotated to create the curvature of the snake. Divide and color frosting.Green and white frosting will be used the most with a small amount of yellow and black. Crumb frost with a thin layer of white butter cream. Position and adhere half moons for eyes during the crumb frost. 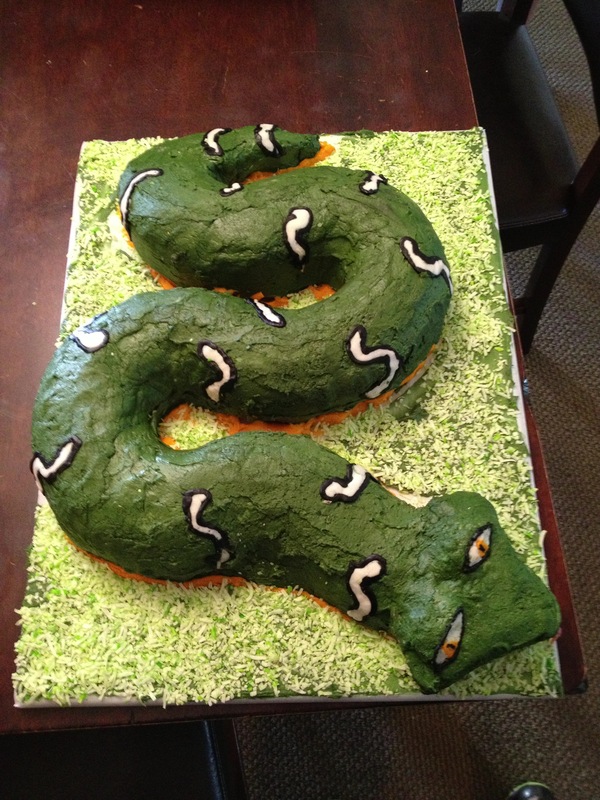 Using a spatula, cover the entire snake with Juniper Green frosting. Let the frosting dry slightly then use a paper towel to smooth out lines and ridges. This is another awesome pinterest trick! Put white frosting on eyes. Let dry. Use papertowel to smooth. Add yellow frosting to eyes. Let dry. Use papertowel to smooth. Using a toothpick with small amount of black frosting, add black line down the center. Foolishly I believed I possessed the artistic ability to create a diamondback snake pattern all over the snake. For the record, I don’t. I tried. I failed. I scraped the entire frosting off the cake, and started over. Internet images to the rescue! Using a #5 decorating tip, pipe white lines onto the snake at random intervals. Let dry. Using papertowl, flatten. Using #4 tip, pipe black around white. Let dry. Flatten with papertowl. Using #4 tip, pipe black to create line of mouth and outline eyes. Using #61 tip, pipe yellow at base of snack to create yellow underbelly. Let dry. Press into snake with papertowel. With leftover frosting (I had more green leftover than any other color), frost the base of the board. Color coconut with light green food coloring and cover base of board to create grass.